« Don’t Forget to Count Your Blessings…. So it’s one week before Christmas and you think you don’t have time to make an ornament? Wrong! 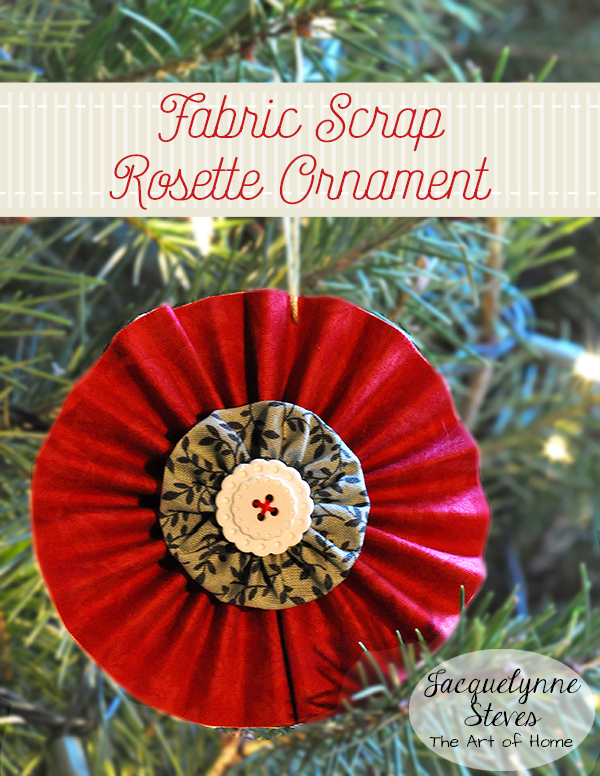 These Fabric Scrap Rosette Ornaments are pretty quick…. What a great scrappy project- You know those long skinny scraps left over after you trim the excess backing from your quilt? Perfect! 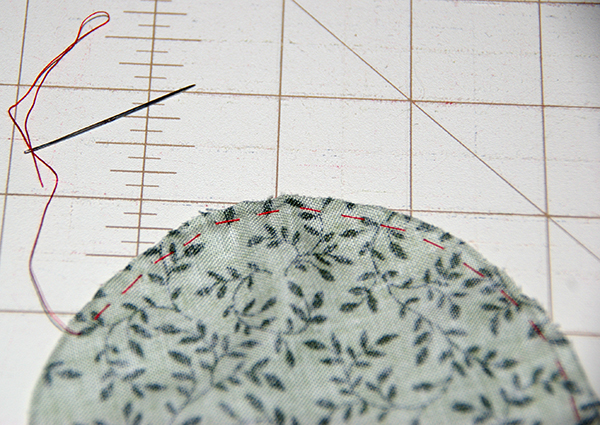 Fat quarters are also perfect for this project. (Oh, and Jelly Rolls will work too, even though they’re 2 1/2″ wide instead of 3″). 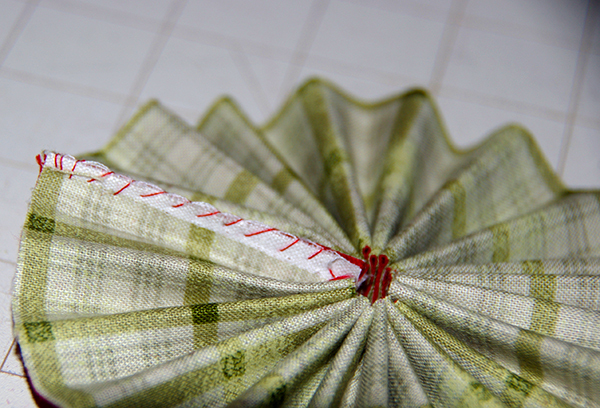 You can even use up your scraps of fusible webbing. If there’s no time to make them for Christmas, you could make them in any fabrics and hang them in your window, or attach to gifts as an embellishment. You could tie them around the neck of a Mason Jar mix or bottle of wine or vinegar for a great hostess gift. Make Blue & White ones to mimic snowflakes for January, or try Red & Pink fabrics for adorable Valentine’s Day decorating. 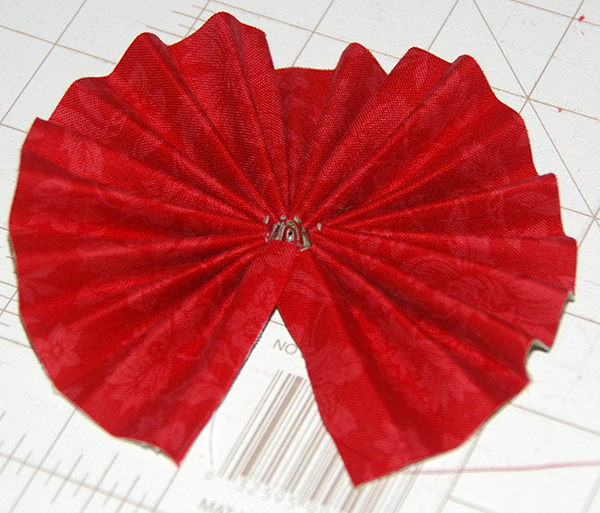 To make the ornament, cut 2 strips of fabric about 3 x 19″. 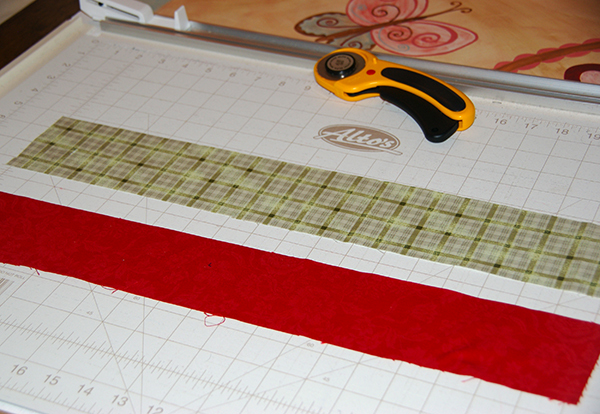 Remove paper backing and fuse the other strip of fabric to the one with the fusible web, RIGHT SIDES OUT. Trim the strip to 2 x 18″. 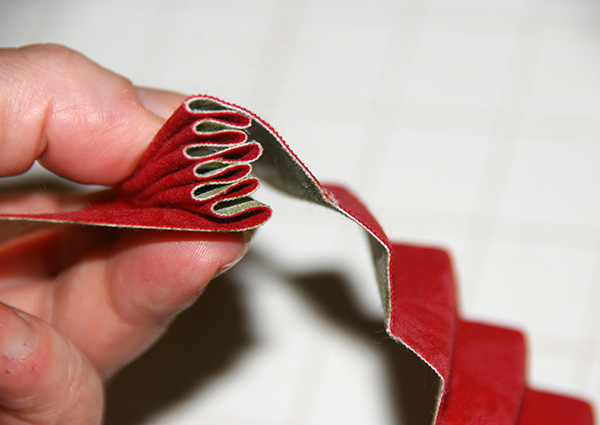 Accordion fold the strip, pressing the creases with your fingers as you go. The creases will stay in the strip, so when the folded piece of fabric becomes too bulky to hold, you can release it and go on to the next section. 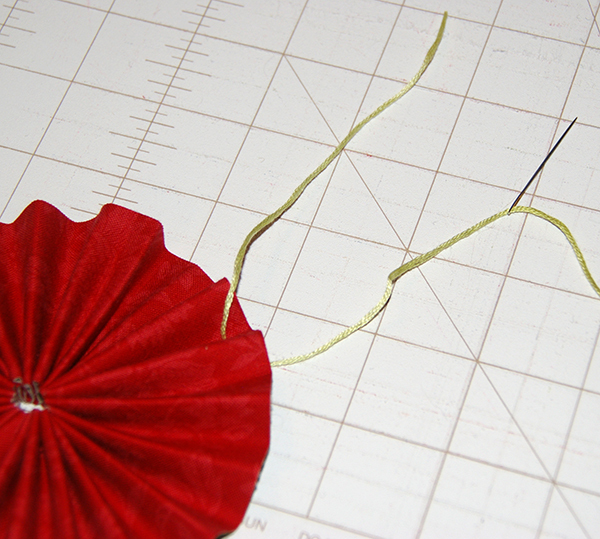 Run a needle and thread through all of the pleats except for the first and last ones. Pull thread so it is snug and tie the thread off. Attach thread or cord to make a hanging loop. Pull thread to gather and tie off. 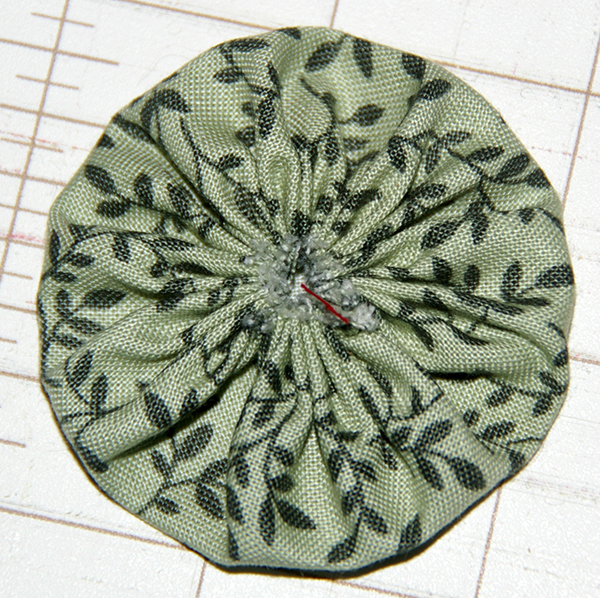 Sew a button to the yo-yo. Glue the yo-yo to the ornament. If you would like a double-sided ornament, simply glue another yo-yo and button to the back. 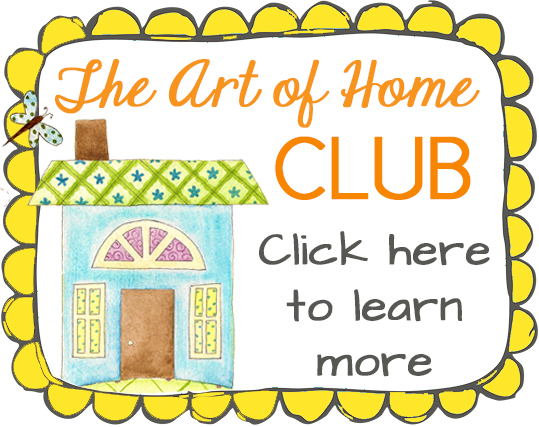 This article was posted in Christmas/Holiday, Crafts & DIY, Featured, Sewing & Quilting, Sewing/Quilting Patterns, Tutorials. Bookmark the permalink. Follow comments with the RSS feed for this post.Post a Comment or leave a trackback: Trackback URL. Thank you Jacquelynne!!! Love seeing your emails in my inbox!! Merry Christmas to you and your family!! Thanks for all the great ideas this year ? Thanks for this really cute idea. Hoping you enjoy your visit with your daughter and that you all have a very Merry Christmas! Thanks, Jacquelynne – these will be great as add-ons to parcels to give them that extra touch and then go on their tree after they open the gift! I pray that you and yours have a great holiday together and a terrific year ahead. Grad school, eh? I hope she gets somewhere close to home so she can visit easily. I want to thank you for everything you’ve contributed to my crafting this year. 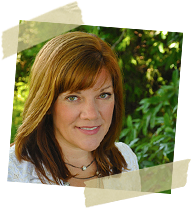 Your projects are always well set out with such clear instructions that anyone could follow. Take a well-earned rest and I’m looking forward to what the coming year will bring. Thank you for sharing your ideas and projects. Thank you this is too cute! Thank you for the rosette ornament instructions. I’ve been struggling with another ornament that has proven to be too time-consuming. The rosette will solve all my problems. Merry Christmas and thank you for all you do and share.